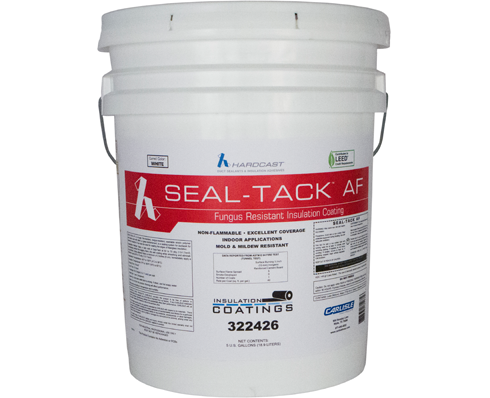 Seal-Tack AF is a tough, ﬁre-resistant, washable, indoor coating used over thermal insulation in areas of high humidity and elevated temperature. As a waterborne acrylic, Seal-Tack AF is specially formulated to resist mold, fungus and mildew growth on its surface, protecting the surface of the insulation. Seal-Tack AF can be used with reinforcing fabric as a sealing system to cover interior insulation, for sealing the edges of cut ﬁberglass insulation or it can be used for binding glass ﬁbers on installations requiring additional fungal resistance. The unique physical properties allow for a brush, roller or spray application providing a uniformly coated surface. Exterior applications require coating over the Seal-Tack AF with Seal-Tack GO. 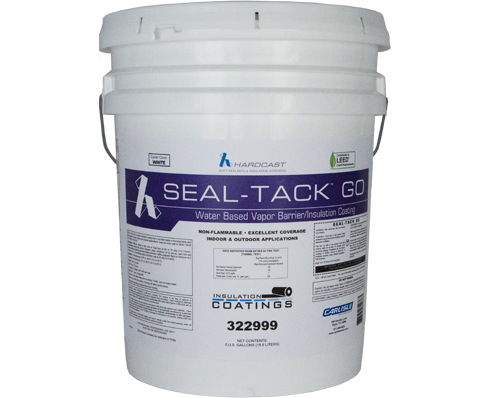 Seal-Tack GO is a water-based, fire resistant, vapor barrier, outdoor coating for most types of thermal insulation, including polystyrene foam. Seal-Tack GO can be used as a top coat for extended UV protection on Seal-Tack G or Seal-Tack AF. This water-resistant coating is non flammable in the liquid state and formulated for both indoor and outdoor applications. The unique physical properties provide an easy to apply material by either brush, roller or spray creating a uniformly coating surface.